Good morning ! I hope you had a great week ! 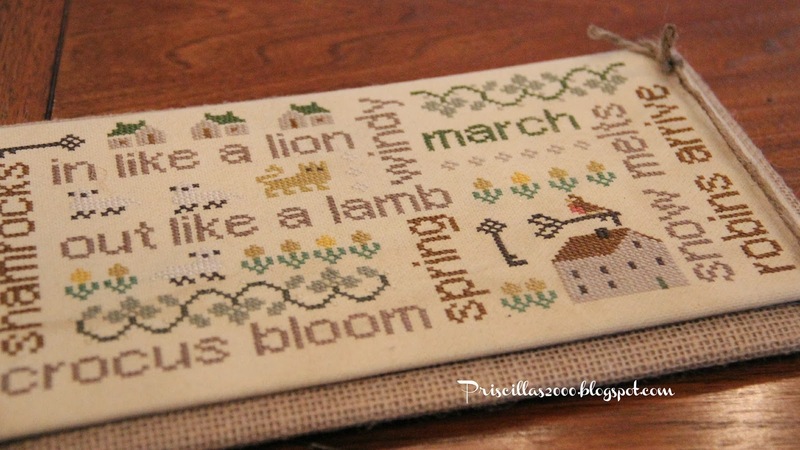 I finished stitching this With Thy Needle and Thread March wordplay last week , and finally got it finished to show you ! I converted all the floss to DMC and changed some of the colors..I didn't want any of the orange in it.. so I used more greens and tans. I was having a little trouble with my magnet system to hold it on the silver tray , so my daughter said I should get some sheet metal and cut a piece to use on the back of the stitchery to hold it to the magnets (I was using 2 sets of magnets ,3 on the stitching and 3 on the tray ) it works perfectly and will be a lot cheaper ! No more magnets to buy. 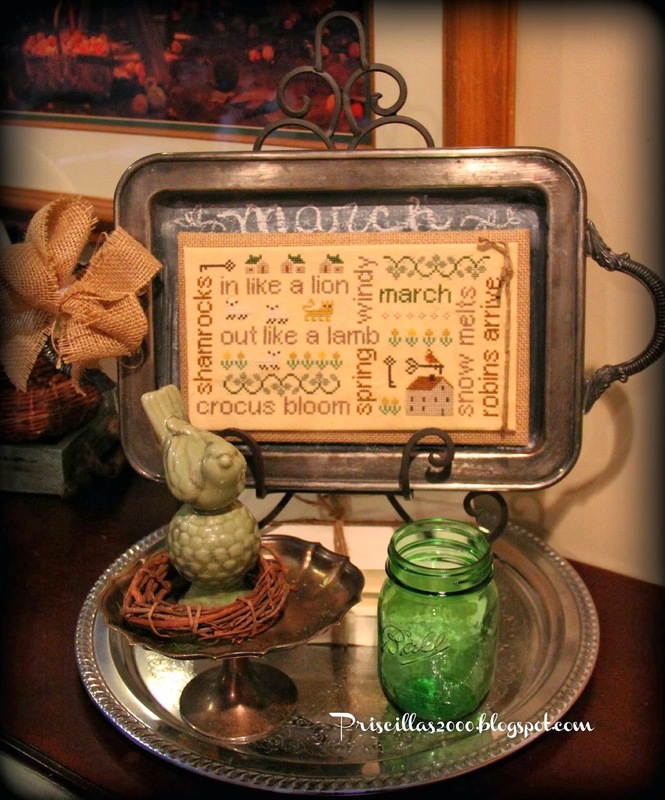 I am working on the March Cottage from CCN , hope to have that finished soon ! We took this photo with our iphones last week in our neighborhood ..I love the reflection in the hood of the car..Do you see all that snow we still have ?!? Hope you have a great weekend ! Thanks so much for your visits and nice comments ! 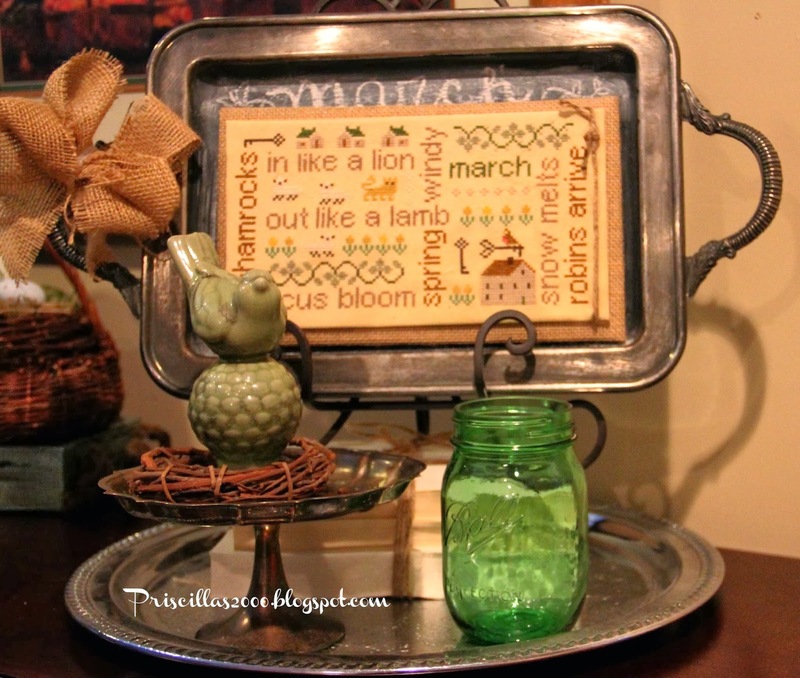 See you on Monday with a project I am doing for Joann Fabrics and Crafts !I would love for you to follow me on Instagram, Facebook and Pinterest ..all the links are in the sidebar ! Off to our Noah's first soccer game. 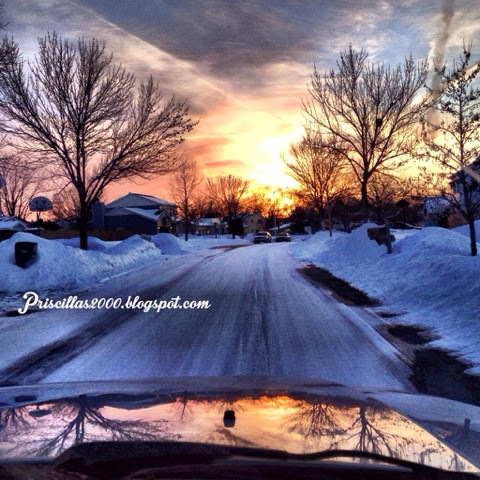 Wow--that last photo with your iPhone is so amazing, Priscilla--just a glorious shot of your snow and the setting sun. As tired of the snow as we are, it is still quite pretty! Word Play looks great. The more of them I have done, the more colors I have changed. My March looks like the recommended colors because it was only the 2nd one I did. I wish I had changed colors but I sure won't do it over!! Beautiful photo of the snow, you seem to have had snow for ages!!!! Bet you're really ready for spring!! Love your March wordplay and how you have finished it on the tray, the colours are just right, surely orange isn't Springy??? Always a treat to see your decorations! 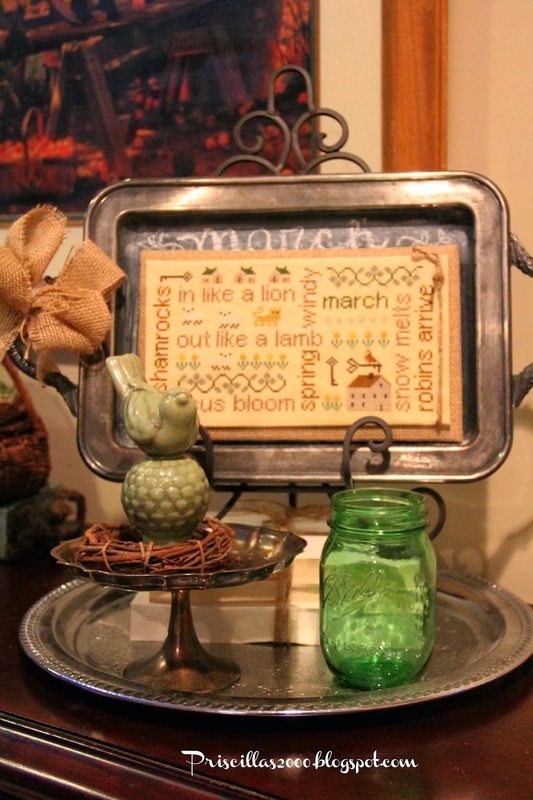 Your wordplay looks great ~ but what I really want to know is where did you find that green Ball jar!?! Love it!! first visit to your site. 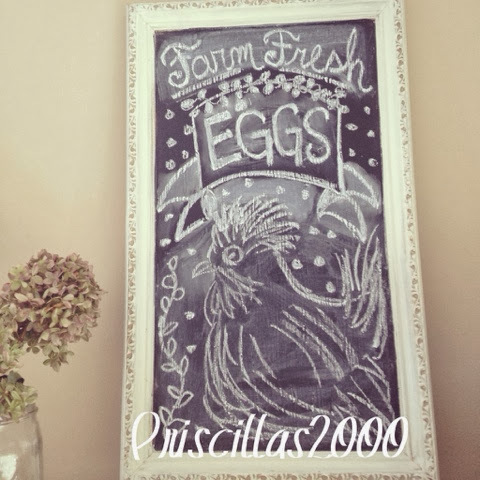 love your cross stitch and the chalkboard. Your picture of the snowy street is beautiful. Just what it looks like here -- still lots of snow! Wish I could stitch as well as you. You are so talented! Love your stitching. I used to do a lot of cross stitch, but my eyes hate me now, so I don't do it much anymore. I need to get me a magnifying light or something. Thanks for linking up to Tips and Tricks. I always enjoy seeing your newest stitching project. Oh my gosh Priscilla, you do still have a ton of snow. We are having gorgeous Spring weather. So sorry! lol! 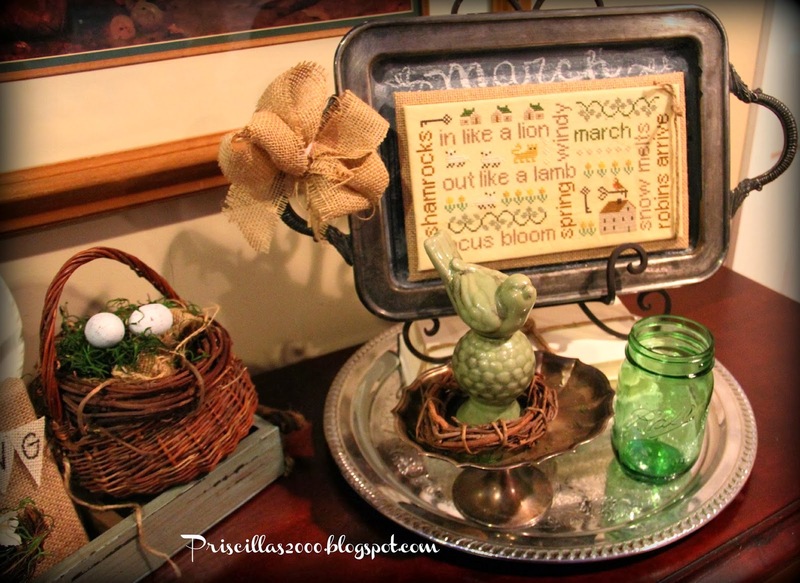 Love your newest stitching and the rooster art is fabulous! I have been looking for the green bottles with no luck. Didn't think to check Michaels. Thanks for sharing with SYC. 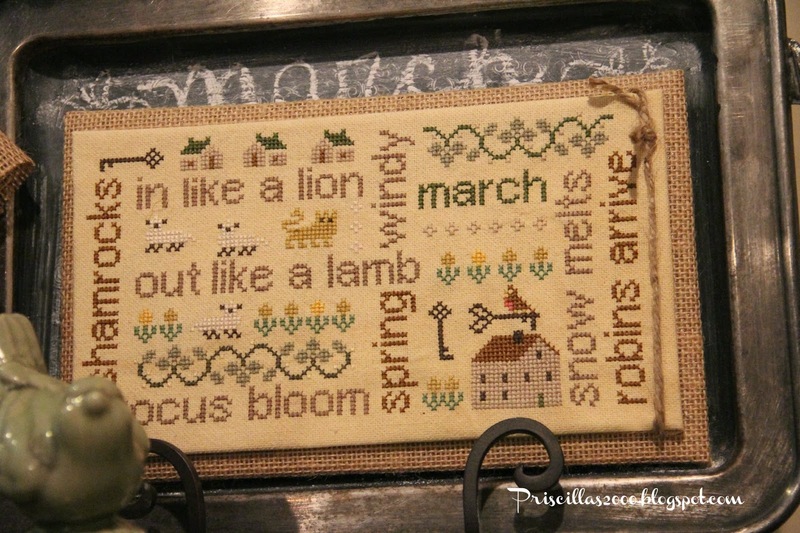 Would you mind disclosing where you got the cross stitch patterns for the months? 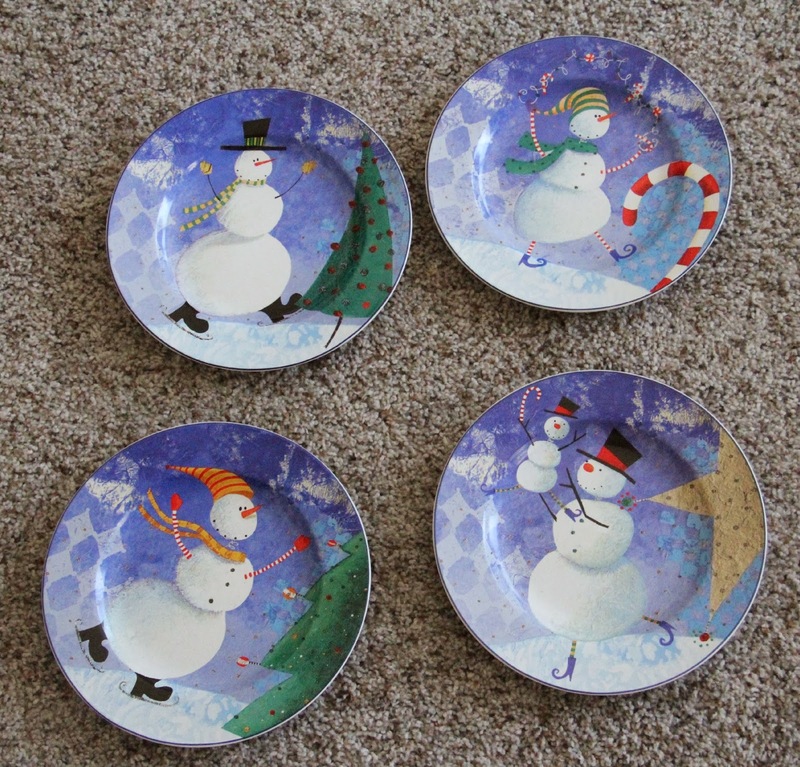 Love them...find it difficult to locate patterns...love your website!